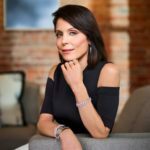 Bethenny Frankel is an American reality TV personality who founded Skinny girl Cocktails, authored four self-help books and hosted the talk show, Bethenny. Frankel has appeared on The Apprentice: Martha Stewart, The Real Housewives of New York City, Shark Tank and was the subject of the reality television series Bethenny Ever After. "Food is not your best friend or enemy." "My business doesn’t keep me warm at night." "Frankly, I don’t trust any diet that doesn’t allow sugar." "I have always been a business person." "It’s my nature to run from relationships, because I have never seen a good one." "Being with my family is my highest priority." "Never eat while doing something else, because you won’t get the satisfaction from your food and you’ll be more likely to overeat." "I have to be in a relationship where I can say what I feel even if it’s wrong – so we can work through it." "I thought doing reality TV would be the greatest success of my life or the biggest mistake." "Faith, culture, structure and guidance are good things."